Our powder coated Yeti Ramblers are very unique in style and come in many custom colors to select from. Only $75 for the 20 ounce Rambler and $80 for the 30 ounce Rambler. Price includes laser engraving of monogram, or name and free shipping. 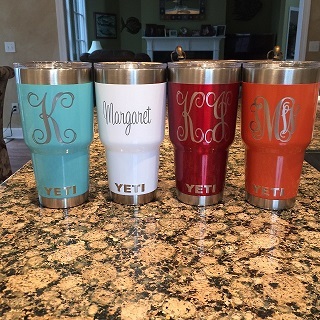 The 20 Ounce Yeti Rambler can be customized in the durable powder coat color of your choice and laser engraved with your choice of monogram or name. Price includes powder coating, laser engraving and free shipping. Specify desired color, monogram or name to include font (see our available fonts page) as you want it engraved upon checkout. Colors available include, Bright Red, Metallic Red, Orange, Metallic Blue, Navy Blue, Light Blue, Mirror Blue, Charcoal Grey, Gloss Black, Star Dust Black, Lime Green, Mirror Green, Dark Green, Neon Green, Sea Foam Green, White, Metallic Purple, Yellow, Pink, and Maroon. The 30 Ounce Yeti Rambler can be customized in the durable powder coat color of your choice and laser engraved with your choice of monogram or name. Price includes powder coating, laser engraving and free shipping. Specify desired color, monogram or name to include font (see our available fonts page) as you want it engraved upon checkout.